Among the best perks of my position as Engineering Manager at Back Cove is performing sea trials to validate a new model or engineering change. Launching a boat that is fresh off the production floor is always exciting, though there have been moments of nervousness as I departed the dock knowing one of our infamous New England Nor’easters was brewing. But then again, what better time for a sea trial? Nevertheless, after a rough-weather trial, it is always a relief once the boat returns to harbor and is securely tied. I take comfort that any Back Cove or Sabre will be safe and sound at the dock during a storm, primarily because of how the strong points are designed. All of our models meet ABYC guidelines so, if we use the Back Cove 41 as an example, all mooring cleats and the structure to which they are attached must withstand a working load of almost 10,000 pounds. Maybe this seems like a lot to ask from a single metal part, but a fully-loaded Back Cove 41 weighs about 30,000 lbs, and the 5/16” diameter mounting posts on our stainless steel cleats can withstand a 35,000-pound pull-force before failure. Since it is unlikely the cleat itself will fail, detailed attention is given to the strong points to which the cleat is mounted. All Back Coves and Sabres have cleats mounted into solid fiberglass. 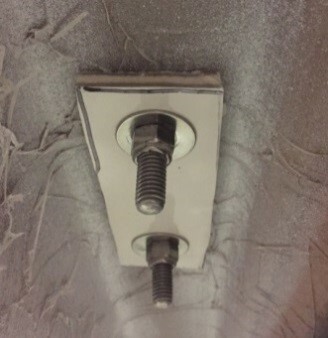 The mounting studs pass through ½” of solid fiberglass and a ½” backing plate. We finish the connection with stainless washers and nylon lock nuts. When force is applied to the cleat, it is distributed from the threads to the nut, then to the washer, the backing plate, and finally to the fiberglass deck. It would be a terrifying force that could rip these cleats off the deck, and I hope never to witness a storm generating those conditions. Dock lines and fenders are the final elements necessary to make any boat genuinely secure at the dock, no matter the conditions. For many boaters; a proper spring line can be masterfully used to maneuver a vessel under challenging conditions. Because all Back Cove yachts have a bow thruster, and many have the optional stern thruster, using spring lines to move into or off of the dock is typically not necessary. However, midship forward and aft spring lines to secure a vessel for long-term docking are advantageous. Once spring lines are in place, a boat can easily be moved forward/aft to make the best use of dock space. Finally, adding bow and stern lines keeps the vessel tight to the dock. I prefer to use the outside transom cleat to maximize access to the swim platform and transom door as illustrated in the drawing above. We have significant tidal changes in Maine, so short spring lines perpendicular to the dock are usually avoided, as they do not allow an adequate vertical range of movement. The 10” deck cleats mounted to the toe-rail on all Back Coves are good for 5/8” braided dock lines and can accept two spliced loops each. When tying up to a mooring, I recommend a 5/8” rope bridle to split the loads between the starboard and port forward cleats. The length of the bridle and painter should be 2.5x the height of the strong point above the waterline. Last but not least, I recommend three fenders on the docked side of the vessel, as illustrated below. The first located aft on the pop-up cleat (on 2016 and newer Back Coves), one amidships at the beamiest part of the hull and one somewhere in between on the rail or stanchion. I like to make my fender whips out of ½” dock line, so they are long enough to tie up to the highest part of the bow rail. Using the bow rails to tie off the fenders also keeps the cleats free for dock lines. Felt fender covers, of course, add to the presentation of the boat and cover up smudges on the unprotected rubber fender. 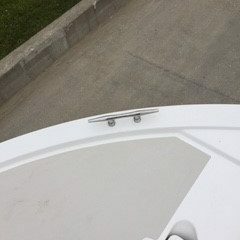 Now that we know everything is secure boat-side, how reliable do the dock-side cleats look at your favorite tie-up spot? 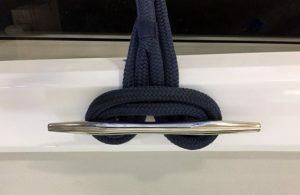 This entry was posted in Back Cove Yachts Blog, In the News and tagged Back Cove Yachts, boat cleat mounting, boat docking, boat fenders, boating, dock lines. Bookmark the permalink. Thanks for the insight. We just love our BC 41. We have put it through all kinds of seas and weather on our Nova Scotia trip last summer. We are embarking on the Great Loop in June. We love the depth and detail of your article. Thank you. We have a new to us 2008 33 and wondered if this Info is available for the older boats. It would be helpful, especially at the start of another hurricane season. We plan to cruise southward from the Chesapeake in the summer to Florida next winter. Here are some experiences we can share after 3 summers of cruising on “Sapphire”, our BC 37 , Hull #65. We prefer 3 strand line over braided lines for fender work. We’ve found the braided to be slippery when the fender is tugged by the pressure of a bouncing boat against a dock. Fender line doesn’t have to be thick. We prefer 3/8” 3 strand nylon. The 3 strand offers a good grip for wet hands and never slips on its self. Thinner line doesn’t crowd the cleat if you choose to tie off fenders on cleats. When we dock up, we use this technique from a lobsterman. My deck crew secures the stern line first and foremost, then steps aside. I then bump the boat in forward Gear, pinning the hull against the dock until all of dock lines are secured. We do not count on the thrusters to “pin”us against the dock. In Maine, Seaweed loves to collect under or near docks. Thrusters don’t like seaweed. Enjoy your boat….we sure do!